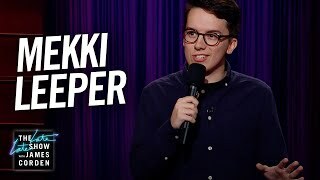 Mekki Leeper is a comedian from Philadelphia now living in Los Angeles. He was a New Face at the 2018 Just For Laughs Comedy Festival in Montreal, and also recently named one of the 2018 Comedy Central “Up Next” comics to watch. He has written for the White House Correspondents' Dinner hosted by Hasan Minhaj, as well as the Lovett or Leave It podcast. His work has been featured on NPR, College Humor, and he can be seen in the Comedy Central digital series he co-wrote and directed, Resolutions. He’s performed at Bridgetown, the Big Sky Comedy Festival, Clusterfest, and was a regular at Good Good Comedy Theater and Helium in Philadelphia.